The Printed Welly Baby Rain Boot will give your little tot cool puddle jumping moves! Durable rubber upper comes in a variety of decorative combinations depending on the color you select. Soft fabric lining for all-day wear. Removable cushioned insole for additional comfort. Rubber outsole for a pleasurable walking experience. Imported. Measurements: Weight: 1 lb 6 oz Circumference: 13 in Shaft: 9 1⁄2 in Product measurements were taken using size 8 Toddler, width M. Please note that measurements may vary by size. Weight of footwear is based on a single item, not a pair. 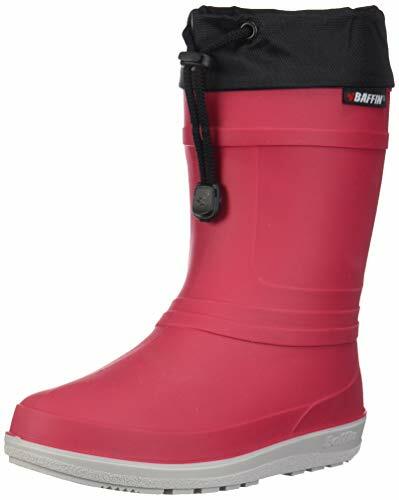 WATERPROOF - These 100% rubber rain boots do what you expect - keeps Children's socks, toes and feet completely dry, the high cut off point keeps water out. COMFORTABLE - These boots are lightweight and Flexible Made of soft rubber that lets young preschoolers run, skip, and jump in puddles without feeling stiff and constrained. Your kids won't want to take them off!! Their non-insulated interior will allow little girls and boys to wear these beyond just springtime. These are lightweight enough to wear in Summer and Fall without being too hot or making little feet cold. EASY PUT ON - These boots come with attached handles so your child can be proud being independent getting their boots on and off. EASY CLEAN - Easy to clean! Just rinse off, dry and wear the next day. FEATURING - Red Ladybug with black polka dot. Slip On For Easy Wear. STYLING OPTIONS : These super cute boots will keep you nice and warm in fall nights. Wear from Fall, Through the Winter, and Into the Spring. Available in Black, Pine, and Red. Great Design - Colorful style with cute little bird pattern, super light weight. Release baby's feet and let your baby enjoy the fun in rainy days. High Quality - Anti-skid rubber sole gives good grip and lessens accidents on slippery floor. Ensuring the safety and comfort. Extensive Use - Perfect for rain/snow days, riding, traveling walking and daily use. Choose one then keep your the feet dry all day. Sincere Service - If you are not 100% satisfied with our product,please contact us,we'll refund or replace it. US size for reference only,Pls check the size info in description. (PLEASE MEASURE the Length of Bare Foot and Compare with the Size Info in Description).100% Recyclable Pvc.Convenient wear,not easy to fall off,easy cleaning. 4 Colors available.Unique design, stylish look,very suitable for children to use in the rain days. Design: Disney PVC rubber rain boot with pattern printed sole edge and cute mickey image details. Feature: Easy to clean, slip resistant, cotton lining, removable cushioned insole, cool mickey mouse pattern design. Style: Traditional cute rain wear style. 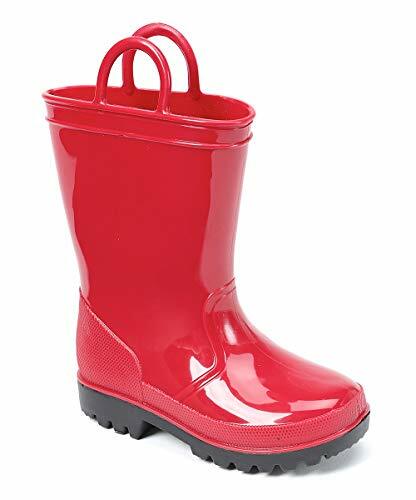 Comfortable and Durable- These 100% rubber rain boots are made from a soft, flexible rubber that lets your children run, skip, and jump in puddles without feeling stiff and constrained. 100% Waterproof- All our rain boots are made with natural, waterproof rubber instead of PVC. 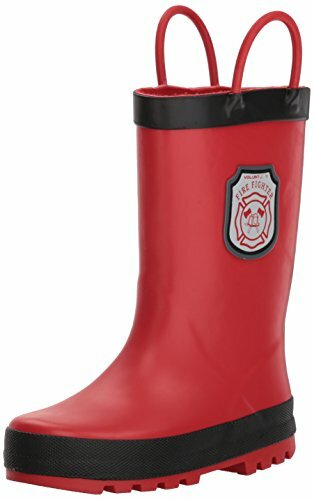 The rain boots keep kid's toes and feet completely dry and warm. Easy Clean-up- after a day in the fun, just rinse off and let them dry overnight. The sleek exterior protects the boots from stains and dirt, and allows them to be functional for everyday use. Stylish design: Functional yet fashionable design, can be worn for many occasions without losing a sense of fashion. ☔Rain boots it is made of high quality PVC ,Soft hand feeling, no any harm to your baby's skin. ☔ Rain Boots with lovely and Charming duck design available,Make your baby more lovely. Buckle strap design makes it easy to take off. ☔ Rain Boots use anti-slip design keeps toddler boys girls in safe. ☔ Gender:Toddler boy, Toddler girl. Shoe upper material:PVC. Sole material:PVC. Style:Casual,Fashion,Waterproof. 3 Colors available.Unique design, stylish look,very suitable for children to use in the rain days. WATERPROOF - Waterproof rubber boots make rainy, snowy and winter weathers fun and comfortable playing outside, it will keep the feet dry and warm all time. EASY TO PUT ON - These Boots come with Easy-On handles so your child can be proud being independent getting their boots on and off, these boots are so comfortable, your kids won't want to take them off. EASY CLEAN UP - Keeps your children's, socks and toes nice and clean and clean up is a snap, Easy to clean! Just rinse off, dry and wear the next day. COMFORTABLE - These 100% rubber boots are lightweight and Flexible Made of soft rubber to be able to wear them all day, and rugged soles means less slips and falls when it's wet outside, Removable insole. FEATURING - Pirate face and Pirate belt, Red edging. The pattern design of the rainboots sole is very anti-skidding. The cute cartoon design and bright colors make your kids attractive even in the dreary weather. 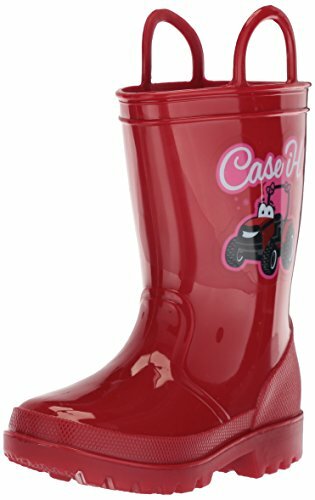 With this pair of rainboots, your kids can cope with the rainy day easily.